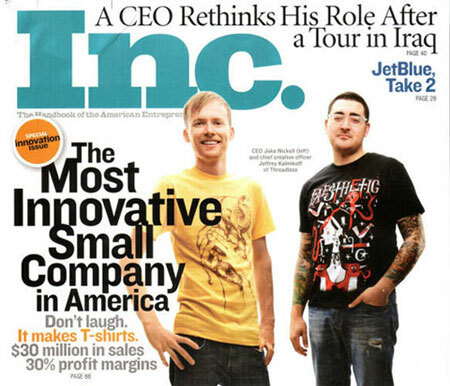 Inc Magazine did a story on Threadless suggesting that it is the most innovative small company in America. The article is quite interesting and has details on wow Threadless was started by the two college dropouts Jake Nickell and Jeffrey Kalmikoff in 2000 with just $1000. The company’s revenue grew by 500 percent a year and they had never done any advertising, hired professional designers, had no sales force or retail distribution making their margins above 30 percent. We all know the model of having community members telling Threadless what to print making it such a successful site. The Threadless user base has grown to over 700,000 members and in 2006 sales reached $18 million and continued to grow 200 percent in 2007 for an estimated $30 million in T-shirts last year. Threadless currently has a 25,000-square-foot office is open to customers and run by 50 employees who are ALL younger than 33. The article explained that Threadless was offered a deal to carry their shirts in both Urban Outfitters and Target but Threadless declined both offers because the companies were unwilling to have a way to for potential customers to learn about the designs and the artists that created them. Threadless did sell a minority stake of the company to Venture Partners for an undisclosed amount. The funding allowed Threadless to open a retail store (which is already profitable) and potentially open others including a children’s store as well as explore a European warehouse to speed up worldwide deliveries. Threadless Tee-V (TV) Episode #3 – Go Fight Win! They are a cool bunch. There were some interesting undertones to that article that told just as much as the puff did. Those guys are paving the way.